Established in 1987, Coleman College has expanded its scope of operations over 29 years to offer a wide range of education and training services to meet the needs of its students. To date, Coleman has graduated over 30,000 students from over 20 countries world-wide. The High School and its Higher Education Departments in Coleman Collage have worked closely with accreditation boards and professional associations such as Cambridge International Examinations (CIE), Edexcel, City & Guilds and Institute of Financial Accountants (IFA). The College also works with other colleges and universities, including Blackburn College (UK), United States Sports Academy (USA), University of South Australia (Australia), University of Southern Queensland (Australia) and the College of Humanities and Sciences of Northeast Normal University (China), creating pathways and articulation for its students to achieve university and professional qualifications. 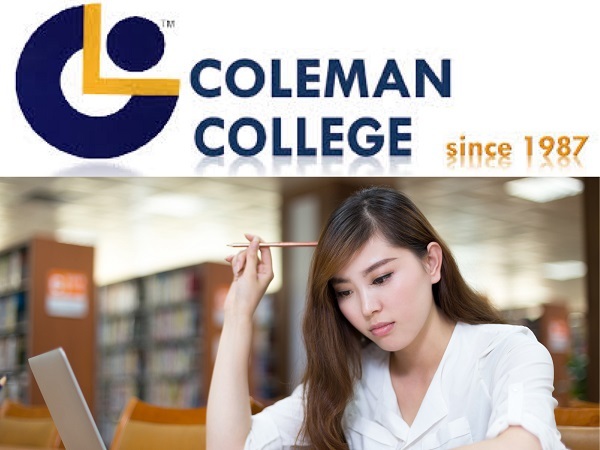 Centrally located at Bukit Merah (Red Hill), with an abundance of amenities and facilities and surrounded by lush greenery, Coleman College is a college that is truly conducive for learning. There are a total of 14 fully-facilitated and connected training rooms and free access to Wi-Fi which enables them to connect to useful online learning resources and to communicate with friends and relatives overseas. Hence, Coleman College is able to foster a high degree of communication and participation within the classroom and produce graduates who are confident, competent and socially responsible.